On the inside... is an immersive music jam experience for music lovers and enthusiasts of all kinds. The audience is placed right in the middle of the jam, made to feel as if they are a part of the ensemble. Seamlessly shifting from classical art songs, jazz standards, hiphop originals and more! We invite you to join us, on the inside. Complimentary refreshments provided by Everyday's a Sundae. Pay what you wish! $15 suggested. Tickets required. All ages welcome. 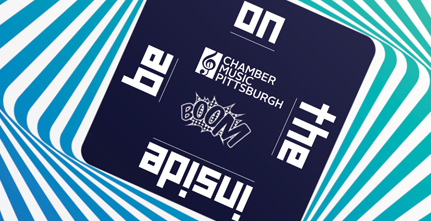 Purchase in advance from Chamber Music Pittsburgh either online or by phone at 412-624-4129. Any remaining general admission tickets will be sold on a first-come, first-served basis at the door on the night of the event. Subject to availability. The box office opens at 6:30PM.